There exist over 70,000 species of fungi, with more being discovered every day! The number of Agarics alone exceeds 5,000! These numbers are huge when compared to, say the 700 or so species of birds in North America and they provide the first clues that identifying mushrooms is more challenging than bird watching. In addition to their vast numbers, the facts that most fungi only fruit for a very short time and are often separated into different species based largely on microscopic differences also indicates some of the difficulties encountered. Yet, in spite of these difficulties (or perhaps because of them) mushroom identification is one of the most enjoyable, satisfying and rewarding pastimes. So how does one get started in identifying mushrooms? Perhaps first by admitting that you are not going to identify every mushroom you find. You are not even going to identify half of the mushrooms you find without hours and hours of work. Second, with many mushrooms you will have to lower your identification standards and be content to identify the specimen as a poisonous Amanita or a Russula or a member of some other large group or genus of mushrooms. Many of these groups contain hundreds or thousands of species, and even the experts have trouble sorting them out. But while mushroom identification is not easy, it is possible. Many mushrooms have distinguishing features that set them apart and it is possible to learn most of the common mushrooms that you run into regularly. The key is knowing what to look for. Keep in mind that the mushroom is nothing more than a fruit, like an apple; the main part of the fungus lies beneath the soil or in the wood. The purpose of the mushroom is to give off spores (microscopic seeds) and it is entirely built around this purpose. Gilled Mushrooms. These are the traditional “mushrooms” that one often finds. They have a stem and a cap and if you turn them over you’ll see blades, or gills, radiating away from the stem. These provide a lot of surface area for the spores to grow on and be released. Boletes. These look almost the same as gilled mushrooms, except that when you turn them over there is only a spongy looking surface. When you look closer, this surface is full of holes called pores that are the openings for tubes where the spores develop. Tooth Fungi. In most cases these have the same basic shape as the gilled mushrooms and boletes (a cap sitting on a stem). The only difference is that they produce their spores on spikes pointing down under the cap. Shelf Fungi. These are primarily fungi that grow out from wood to form shelves which drop their spores through pores (like boletes). There are often tough and last for many years but can be soft and fleshy. Puffballs and Earthstars. As the names imply these are ball-shaped fungi or ball-shaped sitting on a star-like base. They produce their spores inside this ball and puff them out when disturbed. You can find these in all sizes from a fraction of an inch to a couple of feet in diameter. Coral Fungi. These look somewhat like ocean coral. The are usually a few inches tall and grow either on ground or wood with many branches growing upward. The spores are produced on these branches. Cup Fungi. These are small (up to a few inches in diameter) flat saucer-shaped mushrooms that aren’t much interest to the mushroom eater, but can be a fun challenge to the identifier. Morels. Both true and false morels are related to the cup fungi and appear briefly once a year in the spring. 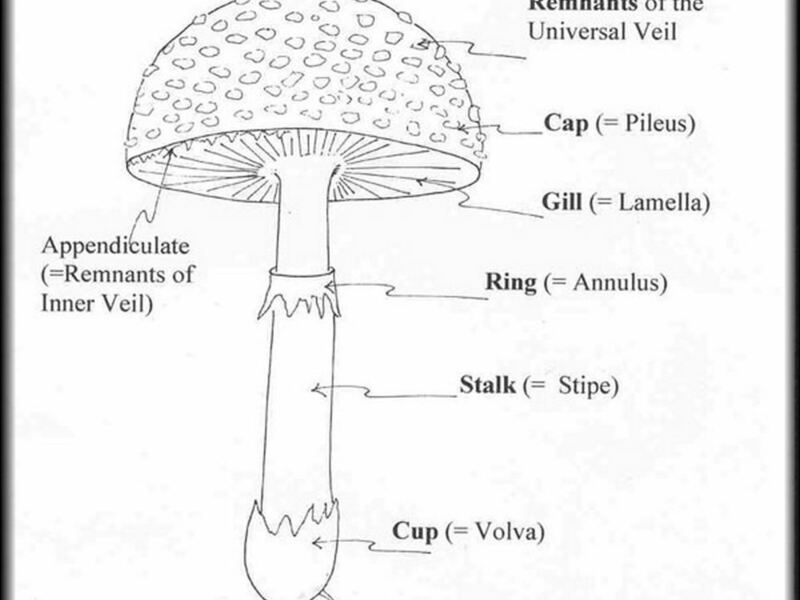 Now let’s concentrate on the gilled mushrooms as an example of the characters of fungi and techniques of identification. Most of what is said will also apply to the boletes.